Single events are part of main eventON plugin. Step 1: Figure out which template file you want the single event page layout to look like. 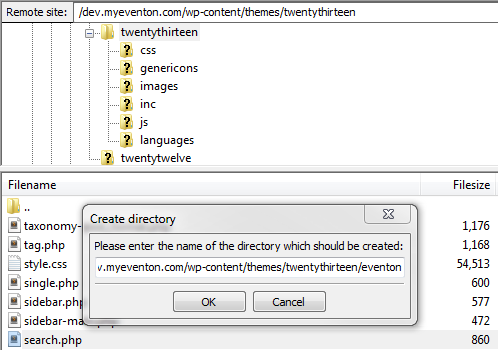 If you want the single event page to look like a regular page in your theme you will need page.php file. If you want the single event page to look like an individual blog post you will need single.php file. Step 5: Open this file from a text editor. You can either copy this file to your computer folder and edit it as mentioned in below steps and upload or some ftp clients allow you to edit files and resave it back to the same place in your server. Which ever you choose, open this file in a text editor. For windows Notepad++ is great for this and for mac sublime text is awesome. NOTE: if you do not see this content php code in the template file look for get_template_part() in this case you will need to open the template part file and copy that content and paste it instead of this function. Or you can comment out get_template_part() sections and see how that would look after following below steps to insert proper single event functions. On the top of the page above any header functions (eg. get_header()) paste the below PHP code and remove get_header() function from the template. Where ever you want to show the sidebar for single events you can place the below code. The sidebar for single events can be turned on from eventon settings > Single Events. Once enabled you can add widgets to this sidebar from WP-admin > Appearance > Widgets page. NOTE: Make sure you are not pasting this inside a php code block (or else it will break) Paste this code outside a php block or paste just the function if you are pasting this inside a php block. Inside the WordPress loop. Rest of the code for this page, you can add edit other codes and those would show up in single events page after you save and update to web host. If your single event page does not show the new edits. — Clear cache on your website and your webhost.